In commemoration of the 50th Anniversary of the Vietnam War, I'd like to invite you to join me at a Recognition Ceremony on August 29 at Little Hall Theater, Marine Corps Base Quantico to honor and thank the Vietnam Veterans of Virginia's First District. Those of you who are close to a Vietnam Vet know that they are a rare breed of patriots—they fought through and overcame some of the most difficult conditions ever known to Americans at war, and then quietly set about making contributions at home as fathers, brothers, businessmen, and statesmen. Many were taken as prisoners of war, embracing loved ones only after years of living in the unknown. Others, their names etched in memoriam in stone on the National Mall, never made the journey home. The men and women who fought in Vietnam are an important part of a 239-year struggle against tyranny. It is time for us to honor their sacrifices, hear their stories, and recognize their unique role in our legacy of freedom. If you or someone you know served in Vietnam, I encourage you to contact my Stafford office at (540) 659-2734 and register to participate in the Recognition Ceremony. Let's take this opportunity to thank our Vietnam Veterans, along with all of our service members, and recognize the significant sacrifices they've made on our behalf. For our system of government to truly work, American citizens and those who represent them must remain consistently engaged in a healthy discussion about the issues at hand. Throughout my time serving the First District, I've found few issues that generate as much passion as the debate surrounding the health care overhaul law often referred to as Obamacare. This debate has been going on for years and will surely remain at the forefront of policy discussions for years to come. The most recent chapter of the story came with the Supreme Court's King v. Burwell ruling, which upheld various provisions of Obamacare. What is important to remember about this ruling, however, is that the Court is not saying that these policies are good, it is simply saying that they pass constitutional muster. The Court's ruling does nothing to change the fact that Obamacare is simply bad policy. I've been fighting for smart health care reform since I was elected. In fact, one of my first outreach efforts was to establish a First District health care advisory council made up of doctors, nurses, and other health care professionals. The advisory council is interested in employing innovation and smart policy to find solutions to our nation's health care challenges. During my time as a public health specialist in Virginia, I was able to witness firsthand the complexities of our health care system. These complexities require a serious, thoughtful, and deliberate approach to reducing costs and increasing accessibility. I believe any reform efforts must maintain a patient-centered system in which the patient and his or her doctor are calling the shots, not faceless bureaucrats or insurance companies. Obamacare is a massive, complicated law, and despite its thousands of pages of legal terminology and regulations, it does not address the true drivers of health care costs. I believe Congress has a duty to prevent the continued harm that Obamacare is creating for our citizens and small businesses, as well as an obligation to implement targeted policies that empower patients and providers, ensure access to affordable, high-quality care, and reduce the number of uninsured individuals and families. There are areas of common ground on which we can build, from allowing young people to remain on their parents' insurance until they're 26, to ensuring that preexisting health conditions cannot keep an individual from receiving affordable coverage. Recently, there has been bipartisan acknowledgement that parts of Obamacare are not working. For example, I proudly supported the Protect Medical Innovation Act, which repealed a portion of Obamacare that excessively taxed the sales of medical devices and, in effect, discouraged advances and innovations in the medical device field. Americans, young and old, deserve to know that good health care is both affordable and accessible, and we can do better than Obamacare. I will continue to fight to address the true drivers of health care costs and pursue true reform. Attached please find a revised agenda for the Wednesday, July 22, 2015 meeting of the FOIA Council to be held at 1:30 PM in House Room D of the General Assembly Building (GAB), 201 N. 9th Street, Richmond, Virginia 23219. As reminders, the Proprietary Records Work Group meets at 10:00 AM on Tuesday, July 21, 2015 in the Speaker's Conference Room GAB. The Meetings Subcommittee meets at 1:00 PM the same day, also in the Speaker's Conference Room. The Records Subcommittee meets at 10:00 AM on Wednesday, July 22, 2015, also in the Speaker's Conference Room. More information about the work of the Subcommittees and the Work Group is available at http://foiacouncil.dls.virginia.gov/subcom_mtgs/2015/subcom15.htm. Thank you for contacting my office to express your views regarding the Federal Communications Commission's (FCC) decision to issue new rules on net neutrality. I appreciate you taking the time to share your thoughts with me on this issue. I value your views on the important issues facing our Commonwealth and the Nation. A major point of contention when discussing telecommunications reform is the question of whether action is needed to ensure unfettered access to the Internet; at issue is whether it is necessary for the Federal government to take steps to ensure access to the Internet for content, services, and applications providers, as well as consumers, and if so, what these steps should be. As you know, on February 26, 2015, the FCC voted in favor of reclassifying broadband internet service from a Title I "information service" to a Title II "telecommunications service" under section 706 of the Telecommunications Act of 1996. Often referred to as "net neutrality", this reclassification is designed to place restrictions on the owners of the networks that compose and provide access to the Internet, as an effort to promote the goals of equal access and non-discriminatory treatment. According to a recent fact sheet issued by the FCC, the 332 page plan is an effort spearheaded by FCC Chairman Tom Wheeler to provide "clear, sustainable, enforceable rules to preserve and protect the open Internet as a place for innovation and free expression". The rules released by the FCC on March 12, 2015 are set to go in to effect 60 days after publication in the Federal Register. Like you, I am opposed to this approach to achieve so called "net neutrality" and the decision by the FCC to adopt new open Internet rules. This vote establishes a concerning precedent for the FCC going forward, by allowing not just control over pricing and speed of the internet, but also content, and therefore restricting the freedoms of the American people. There have been two previous attempts by the FCC to completely reclassify and control the Internet through net neutrality and both times the DC court of appeals struck down the FCC's efforts. In 2007, under a new net neutrality policy statement, the FCC ruled that Comcast despite being a Title I service, restricted customer's ability to access certain networks and therefore violated their right to run applications of their choice, a rule commonly held for Title II services. In response, the court held that in no capacity did the FCC hold authority to regulate Title I services. In 2014, under the impetus of a new "Open Internet Order" by the FCC to apply regulatory methods to broadband internet services, Verizon Corp challenged this order in the DC Circuit. The court held that since broadband services were classified as a Title I information service, not a Title II telecommunications service, broadband internet service providers were not subject to net neutrality rules effectively nullifying the FCC's order. This decision completely rewrites the rulebook on how broadband services are defined and is contrary to decisions by the courts which have ruled against the FCC's authority to regulate the Internet in the past. Like you, I am concerned that as a result of this decision, the American people will pay higher taxes and see less competitive pricing when it comes to internet providers. Please be assured that I will keep your views in mind should legislation blocking the FCC regulations come before the House of Representatives for a vote. Thank you again for sharing your views and opinions with me. I am committed to serving you to the best of my abilities. If I can ever be of assistance to you or your family, please do not hesitate to call me at (202) 225-4261 or contact me online at: www.wittman.house.gov. We, as Americans, consistently recognize the contributions of the many Virginians who played critical roles in the founding of our nation, from George Washington and Thomas Jefferson to James Madison, the "Father of the Constitution." It is the example these historical Virginias set and the direction of this governing document that guide me each and every day as I serve the First District in Congress. The Constitution was a major consideration of mine as Congress recently debated legislation known as the Trade Promotion Authority (TPA), a process in which Congress facilitates the development of a trade agreement with foreign nations by granting the president authority to enter into trade negotiations and setting negotiating objectives for those discussions. In short, the idea is that Congress informs the Executive Branch of what it wants to see in any trade agreement, and with these priorities in mind, the president's trade representatives then go and negotiate with foreign nations. Eventually, Congress takes an up-or-down vote on the final agreement before it can be approved. TPA is a long-term authority that will certainly extend to future presidents, and I thoroughly studied the trade directives set within the bill. My analysis centered on a few overarching questions: Do these directives stand to benefit the American people and our nation's economy? Do the directives enable the U.S. to negotiate from a position of power? Or, on the other hand, are they weak and vague, allowing negotiators to conveniently leave out provisions that are important to industries in Virginia, solely for the sake of finalizing a deal more quickly? After a substantive review, I decided that this particular bill was not a responsible way to bring about a beneficial trade agreement, and I voted against it. To be clear, I also had concerns about the potential implications of Congress ceding so much authority to the president. And in the days and weeks leading up to the vote on TPA, a significant number of Virginians contacted me to express the same concerns, arguing that TPA would weaken the vital role that Congress plays in the system of checks and balances designed by our founding fathers. Too many industries in Virginia will be affected by the terms of any future trade deals, and I am skeptical of the current administration's ability to negotiate a beneficial agreement. In the end, TPA was passed by the House and Senate. I do support smart free trade agreements, and I believe that lowering trade barriers effectively is a critical element of growing our economy. As the White House negotiates this trade deal, I will fight to make sure that the voices of Virginians are heard and that the economic interests of our Commonwealth and nation are protected. The government that our early Virginians helped to establish is dependent on a healthy discourse between the public and its elected representatives. I truly appreciate the substantial feedback I've received from so many of you on this issue. I'm honored to represent a region where citizens are so engaged in the legislative process, and I hope you will all continue to stay in touch. Do you know what we celebrate on the 4th of July? The simple answer is independence, but exactly which of the following actions are we commemorating? Stumped? The answer is number four. Independence was actually declared on July 2, 1776, and the Declaration was signed on August 2, 1776. Thomas Jefferson penned his draft in June of 1776, and the Revolution began in April of 1775. I share these details because I believe in contemplating the circumstances under which our nation declared and attained liberty. Tomorrow I will participate in a parade in Yorktown, site of the final action of the Revolutionary War. Yorktown is home to a constant reminder of the bravery of our founding fathers: the residence of Thomas Nelson, Jr., a signer of the Declaration of Independence and the commander of the Virginia militia during the siege of Yorktown. Legend holds that General Nelson ordered fire on his own home when he believed that the British were using it as headquarters. In today's comfortable modern society, it is difficult to fathom the courage and commitment of this patriot. As you celebrate tomorrow's holiday with friends and family, please pause for a moment. Consider the bravery of the 56 men who, on July 4, 1776, agreed to the language and spirit of our Declaration of Independence. Their actions were the catalyst for the formation of our great nation, the United States of America. As many of you are aware, I am facing an opponent in the November election. During recent weeks, I have been attending events and working hard to meet voters in the 96th District. To run a winning campaign, however, I will need your help! Click HERE to volunteer or HERE to make a donation. 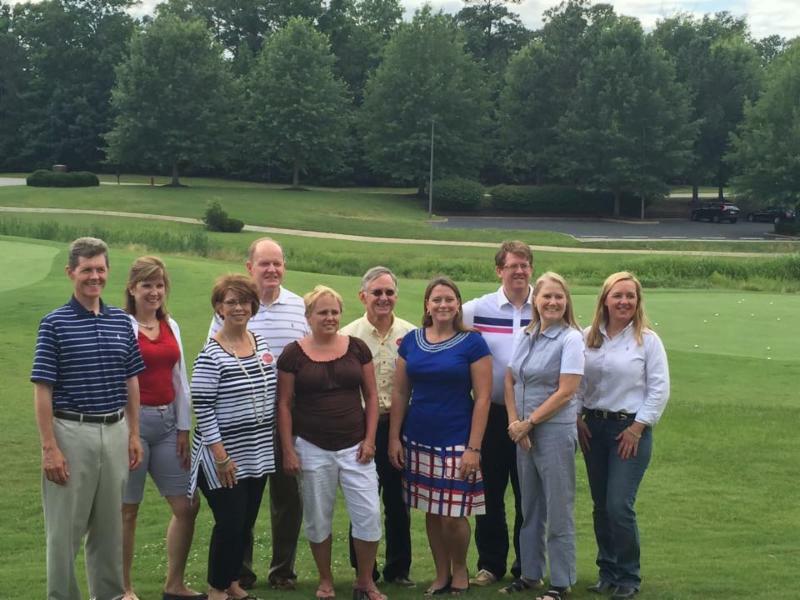 Last weekend I had the privilege of attending the Just Right Party, an event hosted by the James City County Republican Committee. We have an outstanding slate of Republican candidates this year, and I look forward to working with them to achieve victory in November! Support your local Republican Committee and candidates!